• Music 1 is battery- and mains-powered. Its total power is 80W (each driver has its own 40W amplifier), and its battery lasts up to eight hours. It has one 4-inch woofer and a 1-inch soft-dome tweeter. MSRP is $549. • Music 3 is battery- and mains-powered. Its total power is 120W (each driver has its own 40W amplifier), and its battery lasts up to eight hours. It has one 5-inch woofer and two 1-inch soft-dome tweeters, and it comes with a remote control. MSRP is $699. • Music 5 is mains-powered. It delivers a total of 250W (each driver has its own 50W amplifier), and it has one 5-inch woofer, two 3-inch midrange drivers and two 1-inch soft-dome tweeters. The unit comes with a remote control. MSRP is $849. • Music 7 is mains-powered, and its total power is 300W (each driver has its own 50W amplifier). It has two 5-inch woofers, two 3-inch midrange drivers and two 1-inch soft-dome tweeters, and it comes with a remote control. MSRP is $1,099. The entire Dynaudio Music range is available now through authorized Dynaudio dealers in the USA and Canada. 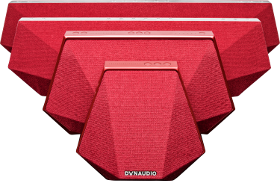 Further information, including high-resolution product and lifestyle images and product information, is available athttp://mediakit.dynaudio.com.